OBDKey® is a match-box sized portable scan tool used to quickly and easily diagnose vehicle problems. Owning a small portable scan tool is essential to monitor the healthy state of your vehicle's engine management system for regular check-ups between services and maintenance periods. I received USB OBDKey 1 hour ago. In that time I have installed everything, and tested on three cars. Great! The Smartphone HTC S710 with Windows Mobile 6.1 works perfectly! Nice bit of kit and quickdelivery! Astonishingly professional product, with decent software !!!! The OBDKey® OBD Interface Unit is a device used for vehicle diagnostics, but not just diagnostics alone. It is also used to measure vehicle performance and the state of your vehicles systems at any given point in time. Whether you are a mechanic, interested in your vehicle's engine management or into performance enhancements, the OBDKey® OBD Interface Unit is the tool of choice. How do you Install OBDKey®? Step 1: Locate the diagnostic port in your vehicle. Step 2: Connect your OBDKey® unit to the diagnostic port. Step 3: Install the software supplied on the 2.0GB USB Flash drive to your PC, Windows Mobile Device, Pocket PC, Palm, Android Device or Smartphone. How Do I Use The OBDKey® Bluetooth Version? This diagram shows a standard installation for the OBDKey Bluetooth unit. OBDKey Bluetooth has no wires. that means no wires at all - no wires from the vehicle's diagnostic socket to the OBDKey unit, no wires or connections from the OBDKey unit to a Bluetooth radio add-on, and no wires to your computer, mobile computing device or mobile phone. Fully functional Bluetooth Car Diagnostic Interface - OBDII / EOBD Car Scan Tool diagnostics. Have you seen the demo of OBDKey Bluetooth and Android on YouTube? and it works great with the G900"
"I'm running Android 2.1 on a Moto Droid with my OBDKey Bluetooth unit. Superb!" How Do I Use The OBDKey® USB Version? This diagram shows a standard installation for the OBDKey USB unit. 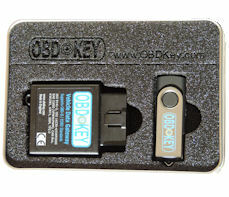 OBDKey USB has just one wire which is supplied with the OBDKey USB unit. That means there are no wires from the vehicle's diagnostic socket to the OBDKey USB unit, just one wire to connect the OBDKey USB unit to your computer. Fully functional USB Car Diagnostic Interface - OBDII / EOBD Car Scan Tool diagnostics. Have you seen the demo of OBDKey USB and a Windows PC on YouTube? How Do I Use The OBDKey® WLAN Version? This diagram shows a standard installation for the OBDKey WLAN unit. OBDKey WLAN has no wires. Fully functional WLAN Car Diagnostic Interface - OBDII / EOBD Car Scan Tool diagnostics. Have you seen the demo of OBDKey WLAN and an iPod Touch on YouTube? OBDKey Bluetooth means great flexibility as it is a totally wireless solution. If you prefer to use a cable, we have a USB 2.0 option with high speed connection to your PC. "OBDKey is a must have for any car enthusiast. I would recommend KBM Systems products to anyone." OBDKey® is available with a wired USB OBD connection or a wireless Bluetooth OBD interface. OBDKey is also available as a stand alone vehicle data logger (ask for more details as this is often customised to suit your needs). Read and reset engine fault codes and plot live data in real-time on your Windows PC or iOS, Android or Windows mobile phone. Packages include everything you need for wired OBD or wireless OBD access to your vehicle, including cables, the OBDKey interface unit, new software and a complete user guide.